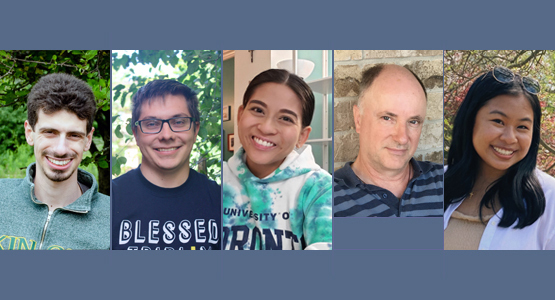 In an effort to increase the amount of support to Youth Ministers throughout the Archdiocese of Toronto, we have assembled a team of Regional Liaisons. It is our hope that these youth ministers, all with many years of experience, will be able to significantly enhance the existing support that I and the entire OCY team provide on an ongoing basis. Maria is a full-time youth minister at St. Patrick's Parish in Mississauga. As a teen, she grew in faith with the youth group there and knowing how valuable it was being part of a faith community, she committed her life's mission to youth ministry. Since then, she's been ministering to youth at St. Patrick's for the better part of 15 years. Maria is the Regional Liaison for parishes in the Toronto core area including downtown, North York, and Scarborough. She can be reached by email here. Courtney has been involved in youth ministry at Nativity of Our Lord Parish since the very beginning 9+ years ago, attending and leading EDGE and Lifeteen before saying “yes” to serve as their Youth Minister. Courtney is the Regional Liaison for parishes in the West end including Etobicoke, Mississauga, and Brampton. She can be reached by email here. Dave has been involved in youth ministry at St. Paul the Apostle Parish since the beginning back in 2007. First as a volunteer and now as Youth Minister, leading EDGE and Life Teen groups, running school retreats at the church, confirmation preparation and serving the parish family. Dave is the Regional Liaison for parishes in the Northern part of the archdiocese including Barrie, Orillia, and Midland. He can be reached by email here. Shelly has been involved in youth ministry for over 10 years, and is currently the Youth Minister at St Isaac Jogues Parish in Pickering. She truly embraced her faith while preparing to receive the sacrament of Confirmation, and through her experience with a music ministry team at her home parish. After a co-op placement with her parish Youth Minister, she furthered her training with the Youth Ministry certificate course at St Michael’s College, as well as the advanced theology of Youth Ministry studies course with Franciscan University of Steubenville. Shelly is the Regional Liaison for parishes in the East including Oshawa, Whitby, Ajax, and Pickering. She can be reached by email here.